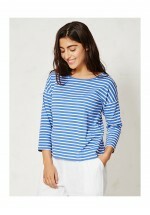 Featuring elegant three quarter sleeves and button-through back detailing, this stripey organic cott.. Featuring Braintree Clothing's very own wave-inspired design, this shape-knitted wrap kimono is made.. Relaxed, smart-fit trousers made from 100% hemp. Features front flat waistband, back elasticated wai.. This organic bamboo T-shirt features the simple, classic stripes look, and is given a lovely twist w.. In soft jersey fabric, this lagoon blue-coloured singlet from Braintree Clothing is made from 67% vi.. Loose structured singlet in well-washed pure organic cotton jersey. Braintree designed this sin..
Boxy, slouchy-fit tee in delft blue with batwing arm shaping in soft 100% pure organic cotton ..
Boxy, slouchy-fit tee with batwing arm shaping in soft 100% pure organic cotton .. This seaside/coast-inspired 3/4 Dial Tunic Dress from Brakeburn features a bold all-over print. It's.. 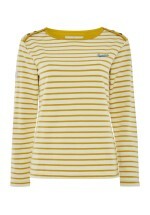 This soft-cotton nautical-style Amber Sweat Shirt from Brakeburn also includes a high-buttoned .. The classic stripe is always in fashion, so here come Brakeburn with this Bella soft premium-feel Cr..